Trying out a new cut file I found at the Silhouette store. 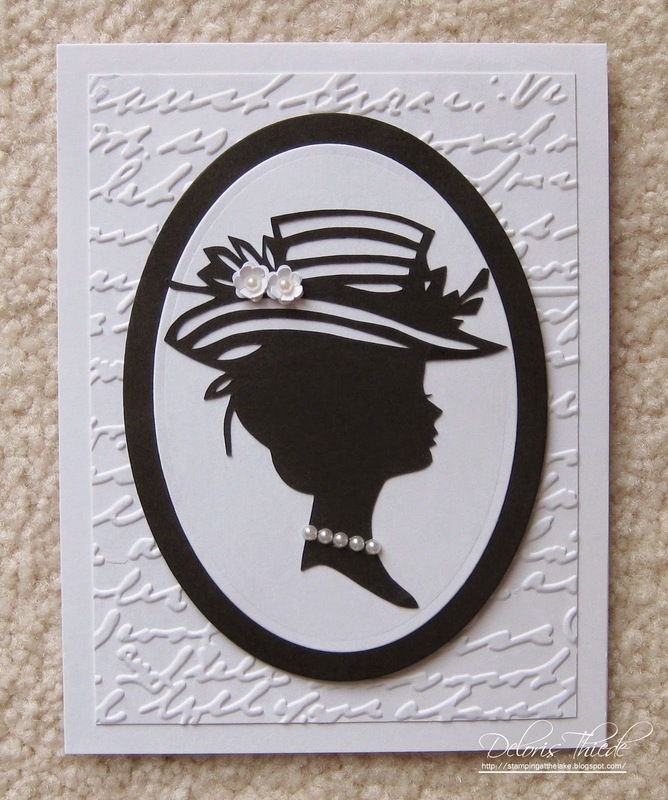 I used my Silhouette Cameo, Vintage hat lady Silhouette file #42491, 65# black cardstock, 110# white cardstock, Spellbinders Nestabilities Petite Ovals Small, Cuttlebug Script embossing folder, Sizzix Bigkick, pearls and a tiny flower punch - maker unknown. This is beautiful! Perfect embellishes and perfect embossing folder to accompany that gorgeous cut! Gorgeous...love your new cut file! Awesome job. I have moved again to another friend's house for several weeks. Main computer is not set up yet. I will be in touch. Snow is almost gone. Tempt should almost be 70 tomorrow. This is stunning! I love the embossing and that silhouette is fantastic!!! Thanks so much for playing along with us at Open-Minded Crafting Fun Challenges!!! Good Luck! I hope we see you again!! Lovely card, thanks for joining us at Whoopsi Daisy. Just checking out the talent from Make it Monday! Gorgeous! I am going to have to CASE this card! It is just too stunning! A very elegant card love the cameo thanks for joining our challenge at crafting from the heart. Holy Moley....that is totally awesome Deloris! I mean totally awesome!!! Such a classy card. Thanks for join us at Whoopsi Daisy challenge this week. woooooow this is so beautiful. Love the use of that silhouette and the addition of the pearls and the flowers to the hat. Great embossing as well!!! Thanks for playing along with us this month at Little Claires Deloris with your lovly card.